Coventry manager Mark Robins and Plymouth striker Freddie Ladapo win League One awards, while MK Dons boss Paul Tisdale and Grimsby goalkeeper James McKeown win in League Two. 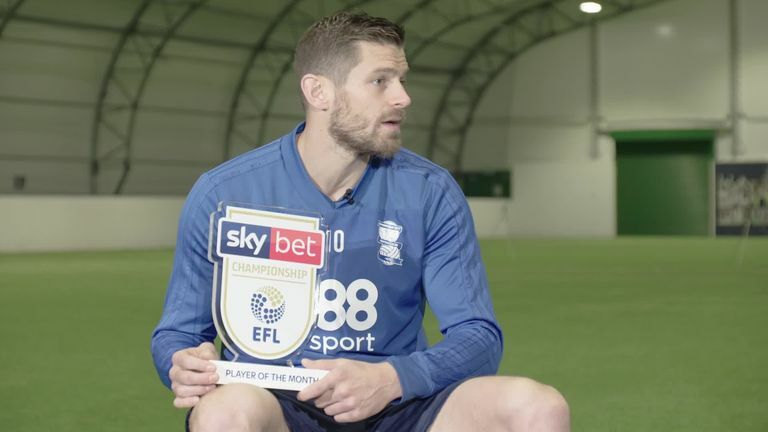 Birmingham City striker Lukas Jutkiewicz has been named the Sky Bet Championship Player of the Month for October. In the form of his Championship life, the striker demonstrated his prowess in the air with three towering headers among his five goals, which included a hat-trick against Rotherham. Also set up his side's winning goal at Stoke. Jutkiewicz said: "It is lovely to pick up this award. I very much appreciate it, but it has been a good month for us as a team, we have picked up a lot of points and managed to turn what was a lot of draws into the wins that we wanted. "I think a lot of the credit goes to my team mates. I rely on the service they provide and that has been top quality, so have to thank them for that. "Playing regularly helps. Since the manager has come in I have played in all the games and it helps with your confidence to know that a manager is willing pick you week in, week out." Queens Park Rangers manager Steve McClaren has been named the Sky Bet Championship Manager of the Month for October. The scrutiny was sharp in late summer after a poor start, but McClaren quietly trusted his methods and his players to steer Rangers into the top half with an October haul of 13 points from five unbeaten games. 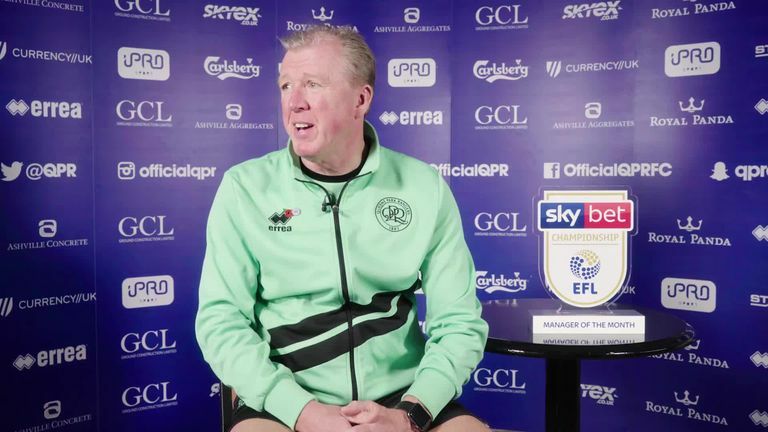 McClaren said: "I have got to say the response of the players has been good, but the main factor we've had such a good October was the staff I have got around me. It is all about people, it is all about players, it is all about staff and the staff have been absolutely magnificent. "We could have crumbled after four games, but they stuck together, we all did. Matty Gardiner, John Eustace, Gavin Ward, the Sports Science team behind, the medics who are keeping the players fit and everybody at this training ground, everybody at the stadium, even the supporters are sticking together." Robins' side ended the month with five successive league wins, making light of the transition from League Two following promotion. Impressively, his side scored eight goals in winning away at Charlton, Southend and Bradford. Robins said: "We played some good football early on without getting the results that we deserved to get, but I think that everybody has worked really, really hard behind the scenes and the players have been brilliant this month. "It is a tough division and difficult to get results in, but we have managed to do that over the last month or so. Hopefully we can kick on and contribute some more good performances because I think some of the football they are playing really entertaining." Veins of form do not come much richer. Six goals and two assists in six games for Ladapo, who scored every type of goal, including a lovely individual effort against Burton, to help lift Argyle out of the relegation zone. He said: "It's a fantastic month for me. Obviously, it took a while to start off at a new club - I just signed this summer - but I think the players, the fans, the management, they've made it easy for me to settle in. "I'm enjoying my football a hell of a lot. Coming here as a new player, you want to just hit the ground running and get going, and I think the goals I've scored have given people a lot of confidence in me - and playing in front of 10,000 fans every week is fantastic. "Being so far away from home, you don't know what to expect; you think it might take a while for you to settle in. But the people here have just been fantastic and made everything to easy. Six goals in six games - I think this is the best goal-scoring form I've been on so far, and long may it continue." It took 10 years at Exeter for Tisdale be named Manager of the Month. He has managed it in three months at MK after a near-perfect October in which his side collected 16 points from a possible 18, conceding just two goals. Tisdale said: "Coming into a new club you always hope to hit the ground running and get some results, so we have done that and I am looking forward to the season ahead. Things are going really nicely, but I want to be very careful not to get too carried away. "It is early days, I have certainly concentrated on the process of our performances, the results as nice as they are a product of that and there is a lot more work still to do, so forgive me but I am tempering all our excitement with knowing that it is only November and we have got a lot of games to go. "But I'm very pleased with how it has gone so far and the way I have been welcomed into the club, there are lots of very good people here and it is a very nice place to be and I am very happy so far with the work that we have done." Four clean sheets in five games for a keeper at his shot-stopping best in October for McKeown. Acrobatic as ever, he made a series of saves against Colchester and Crewe as well as a spectacular penalty stop to preserve a draw against Exeter. McKeown said: "Being a goalkeeper, you might get the odd well done here and there but in general you don't get a lot of recognition. I always think you are quite happy if you're like a referee really and don't get noticed, take your six out of ten and that will do. This is definitely for the goalie's union. "It was a good month for us as a team, not conceding goals, but that isn't just down to me, it is not just down to the back four either it is down to the whole team, so I suppose it is for everyone."